I’ve always heard that “necessity is the mother of invention” but I also think of it as “the mother of learning something new”. Such was the case recently after a productive trip to our local grocery, which is owned and operated by the Absentee-Shawnee Indian Tribe. On this particular day I discovered that the store had block cheese on sale; 1 8oz block for $1. Never one to pass up a good deal, I decided that if one block of cheddar was good, 20 blocks of a variety of cheese was phenomenal! I tossed mild cheddar, mozzarella, sharp cheddar, pepper jack and cojack into my cart and trotted on down the isle. To my surprise, I found that Velveeta was on sale too. Oh joy. Now, I must digress here for a sec in defense of Velveeta cheese PRODUCT. Although I realize that Velveeta is the plasticized version of cheese, it is a must for any kitchen simply because it melts sooooo smoothly. It is wonderful for cream soups. It is true that nobody REALLY knows where Velveeta comes from. And while we are told that it is made from milk, it could be guinea pig milk for all we know. However, while we ponder how one milks a guinea pig, the rest of America is enjoying its queso made with Velveeta, picante sauce and maybe some ground beef flavored with taco seasoning. Velveeta is to the cheese world what Spam is to the ham world. Each has its purpose. And so, I got my Velveeta and checked out. On my way home, it occurred to me that keeping all this cheese fresh was going to be a big job. I usually grate my hard cheese, put it into bags that I can vacuum on my FoodSaver sealer and then freeze it, but this was going to be an enormous amount of grated cheese. What if I wanted sliced cheese? My experience with freezing blocks of cheese for slicing had been less than successful. I had been totally unhappy with frozen Velveeta, so what to do? What to do? Thank goodness for the Internet. Enola Gay at Paratus Familia had the solution. Can it! Can cheese? Really? She showed how to can hard cheeses and that got me to thinking about canning the Velveeta too. 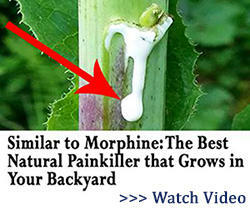 I researched and researched, and found several ways to do that as well. I wound up with what I think worked best for me. So first I’ll show you how I canned the hard cheeses, and then the Velveeta. Talk about handy. 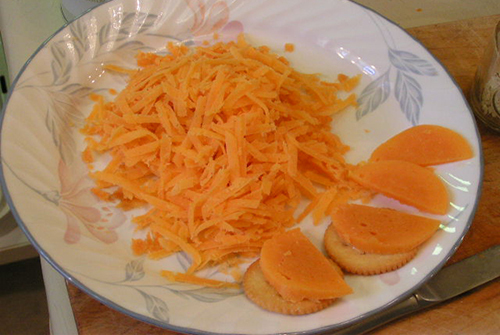 You can’t believe how wonderful it is to have canned cheeses. 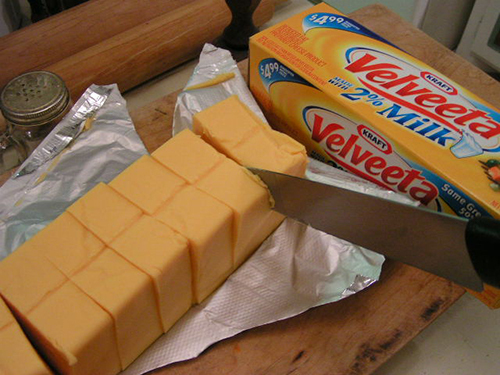 You can shred and slice the hard cheese and the Velveeta is just as good as if it were in the box. I suppose at this point I should throw in the disclaimer that I haven’t found anything that indicates the government watchdogs have given their seal of approval to this, but then, they don’t like us canning apple pie filling either. From everything I have read, these canned cheeses last up to two years. It is important that you sterilize your jars. Here, I am using the 8 oz size because there are just two of us and that is perfect for two people. 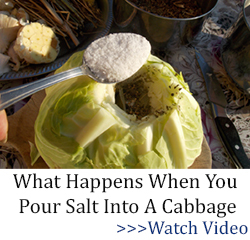 First I wash them in hot, soapy water and then place in a large pot to bring to a boil. Then I remove them to place upside down on a dry towel. It is important to use wide mouthed jars for easy removal of the cheese. Shred the cheeses. You can use a food processor here, but by hand isn’t all that much more time consuming. 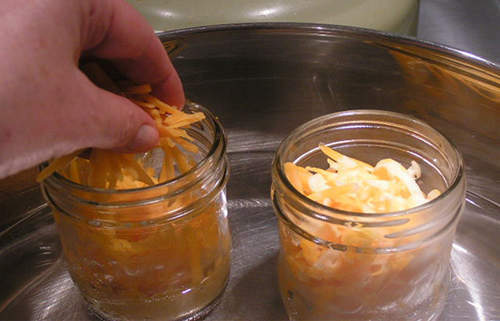 Place some of the shredded cheese into the warm jars, and place the jars in warm water that you slowly bring to good and hot. Keep adding more cheese as the cheese melts. Continue adding and melting the cheese until it reaches a 1” headspace. This requires a deeper headspace because of the oils. 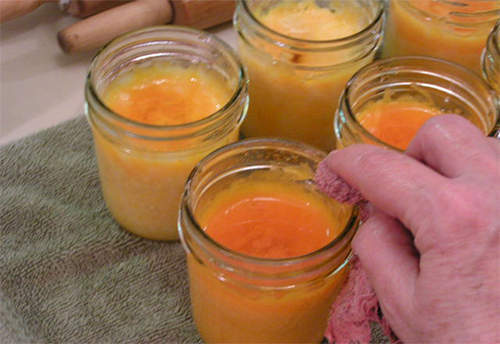 Carefully wipe the tops of the jars with a damp, soaped washcloth to remove all oils. Lower the jars into water that has already been heated. Putting them into cool water will crack the jars. Bring to a boil and at the point of boiling, set your timer for 40 minutes. Process for 40 minutes. Now here is the important part!! I didn’t figure this out until I pulled the first jar out of the water. 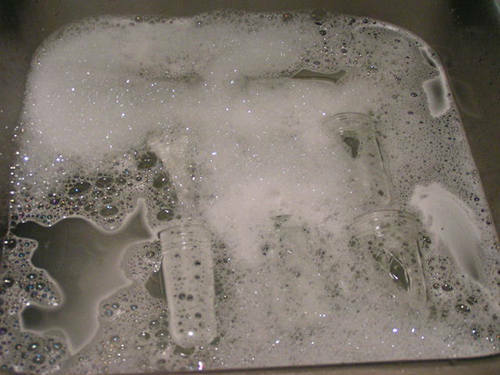 DO NOT REMOVE THE JARS FROM THE WATER UNTIL THEY HAVE COOLED DOWN. If you take them out of the boiling water, the oil from the cheese boils out of the jars and they won’t seal. Just leave the jars of cheese under water and allow to cool slowly. THEN take them out of the water. When they have cooled all the way down, I remove the rings and wash jars and rings in hot, soapy water to remove any oils. After drying, I reapply the rings and store the jars of cheese. 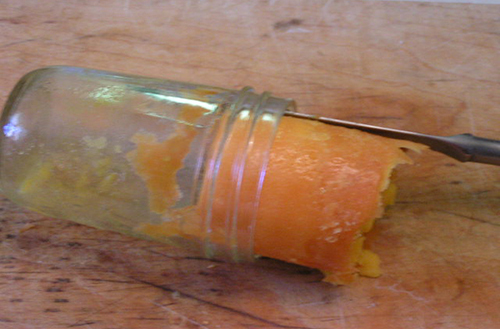 To remove the cheese, open the jar and slide a knife inside the jar and around the cheese. The cheese will just slide out. 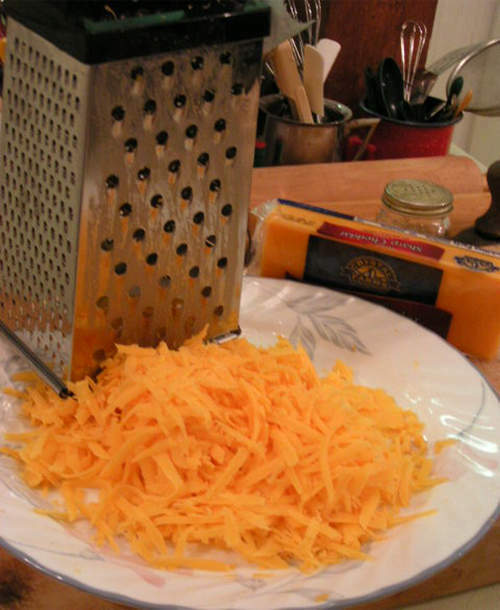 You can then grate it. At first it is a little oily, but that is just because it is at room temp and some of the oils have separated. Or slice it! It’s perfect for crackers and cheese. Pour the cheese into jars leaving a 1/2 inch headspace. I use 8 oz jars. I can always open two if I need a pint. Put rings onto the jars and tighten down slightly. Place jars in waterbath canner rack and lower into water that has already been heated so not to crack the hot jars of cheese. Bring the water to a boil and at the point of boiling, set your timer for 10 minutes and continue to boil. 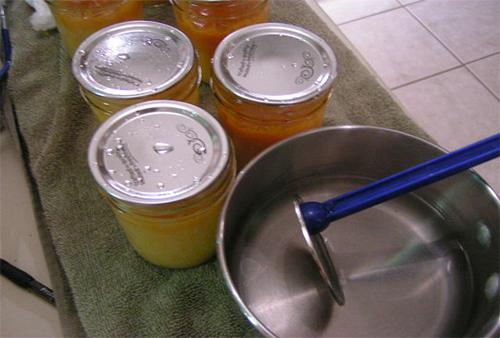 Remove jars from water and allow to cool on a dry towel. You will hear the lids pop as they seal. And so, I’ve learned something new out of necessity. I LOVE having cheese in the can. 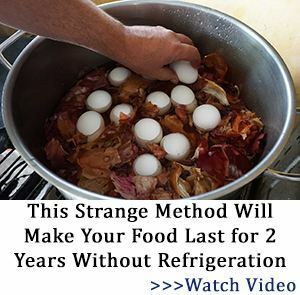 It is so easy and I don’t have to worry about refrigeration. The cheddar gets a little sharper as it ages and tastes wonderful when opened. So cut the cheese and call me “Happy”!! This article first appeared on The Oklahoma Pastry Cloth™. Haven’t done this yet, your method is about what I also have read. Only change I would make. When wiping the rims, I use vinegar as it cuts any oil better. The rims must be perfectly clean to seal the jars. Have very few fails now that I use a vinegar cloth. If you go to youtube you can watch videos on how to make your own velveeta. Super easy and delish. I heat my cheese right in the jar for cheese dip. Yum! Nice article. Thank you. 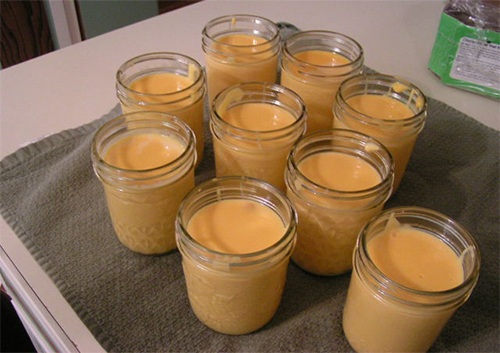 For your canned cheese are you using a pressure canner or a boiling water bath? Much, much safer with a pressure canner. 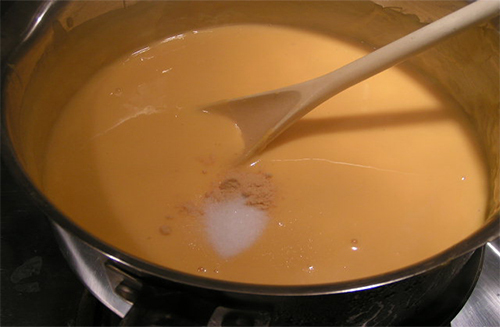 Water bath may not heat contents uniformly because of the density of the cheese. Be safe.Pressure can everything. Oh my word – canned cheese – what a great idea. Thank you!! I’d much rather preserve it this way, than purchase processed powdered cheese of uncertain quality and too many unknown ingredients. The picture indicates 2 lb box, however, velveeta is so salty I would not add the salt, my preference. Also after washing the jars, rinse well then boil 15 minutes to properly sterilize. I’ve been canning for over 50 years. Oooh! This is a ” grate” article! ( Sorry guys – I suffer from prd – pun related disorder). Kidding aside I’m looking forward to trying this. Thanks. Save time by dipping cheese into wax for a coating,will last for years. Do you mean the cheese itself, like is done when making gouda for instance, or do you mean sealing the top of the jar with a layer of wax? I looked through this article and it is something which I will try, some day. In some ways I don’t see the need for canning the cheese. I have had excellent luck with buying the 2# bricks of cheeses I catch on sale. I live in a Motorhome with no refrigeration and have lost only a single 2# brick due to mold. I have stored/aged Bandon Cheese, Tillamook and Kroeger cheddar and Monterey cheeses. the only one that won’t last over a year is the pepper jack. Peppers don’t last much beyond 6 months, but Jack cheese ages faster and reaches a good sharpness taste within 3 months. Bandon cheese will hold for several years, but it is probably packaged with a bit more water content that Tillamook as after it is about 4 years old, more whey separates. This doesn’t seem to happen with Tillamook and I haven’t found Bandon on sale since Tillamook Boudht them out. On friend of my wife’s was a forklift operator in Tillamook during the flood in 1997. The flood waters reached into the lower warehouse as he moved the palets of cheese to higher ground. Clear back in the back was a single palet that was submerged in the swolen and contaminated river. The contents of that pallet could not be sold, but it containde a 30# wheel dated someting in the early 1930’s. He was given first choice of that on the palets and chose the 30# wheel. They used thicker layer of wax on the wheels bck then and he figured it hadn’t been immersed long enough to contaminate the cheese. I had the privilege of tasting it. That was a well aged cheese. Most of the aforementioned cheese will age well up to 4 years without refrigeration unless the plastic wrap is pierced. They begin to age flavor wise about a full year after the expiration date. Personally, I find Bandon Cheese to be insipid until that year has eclypsed. Do you mean that a block of cheese say a 1# of Kraft cheese in the plastic will store in a cool place without molding? Can’t you just dip the chunks into a thick coating of parafin, wrap, and store in a cool/cold place. Maybe I’m wrong but isn’t that how some cheeses are stored? 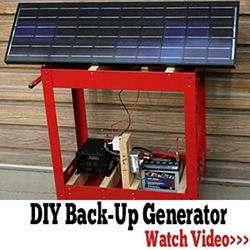 Yes, you could and much less time and energy waste! Agreed, Jackie, although if you have the cheese in a jar, there’s less chance of rodents nibbling at it. 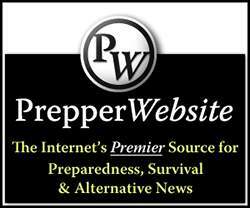 It also offers more protection if you want to transport it, or put some in your bugout or get home bag. I have canned sharp cheddar, cheddar, mozzarella and cream cheese using this pretty much same idea. Basically you are sealing the jars to keep from air and contaminates. Yes! My local Kmart used to carry a very good canned (uncooked) bacon. They don’t any more, mores the pity. I keep hoping to find a similar product that’s not too expensive. This is awesome info. I’m a newbie to this page, but I’ve been prepping since before there was a name for it. Ready for a cheese sale! I have a serious concern regarding this recipe, called Botulism. 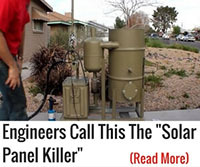 You are using a Hot Water Bath for a product that IS NOT safe according to all my readings as it is neutral in it’s PH. 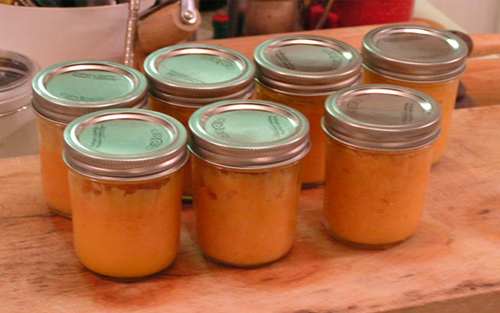 Have you checked out this recipe with a canning expert such as a Home Economicist? These can be found sometimes in the Farming Extensions. I believe this, like meat for example can only be considered safe using a Pressure Cooker, though I maybe wrong. Or as a safety feature like the Pesto I make. It was suggested that I can can, but to store the product in the fridge and only for 6 months. Then throw out the product. Is this the anwser your looking for? I am concerned about the process. Why not use a pressure canner for this food? Great Idea! Does the water in the pot stay below the lids or do you submerge the jars? Since you say not to tighten them to much, and if they are submerged does water get into the cheese? Hard to tell by the pictures..Thank you! Good question I was wondering about that as well. I will reinterate, this recipe is dangerous. This product is pH neutral and very dense there for botulism is possible. By the time you get the symptoms of botulism, you may go blind and your liver will fail and therefore ultimately death. You may go blind and your liver will fail and therefore ultimately death. Product requires a pressure cooker . People look to you for advice why don’t you make sure the advice is sound. You’re lucky this time are you willing to gamble with your family’s life? Do you u want to die trying to save $$?I will reinterate, this recipe is dangerous. This product is pH neutral and very dense there for botulism is possible. By the time you get the symptoms of botulism, you may go blind and your liver will fail and therefore ultimately death. You may go blind and your liver will fail and therefore ultimately death. Product requires a pressure cooker . People look to you for advice why don’t you make sure the advice is sound. 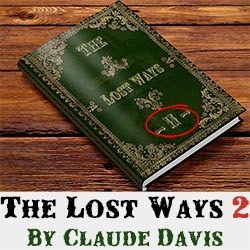 You’re lucky this time are you willing to gamble with your family’s life? I’m with you, Rydaartist – I doubt if there is any safe home canning recipe for cheese. You can buy a safe commercially canned cheese from Red Feather (don’t know of any other companies), but it tastes like processed American cheese. I didn’t care for it. Botulism is rare, but it’s a gamble I don’t want to take. I’ve read descriptions of what happened to the victims – the least painful is death. Being paralyzed isn’t something I want to experience. Just an FYI. Botulism poisoning causes paralysis. It would be extremely rare for it to cause blindness but it can cause blurred vision. Patients die when their chest muscles stop working and they suffocate unless they are placed on mechanical ventilation until the symptoms wear off. Use cheese wax. You can get in on Amazon. If waxed correctly, it will store for years even without refrigeration. 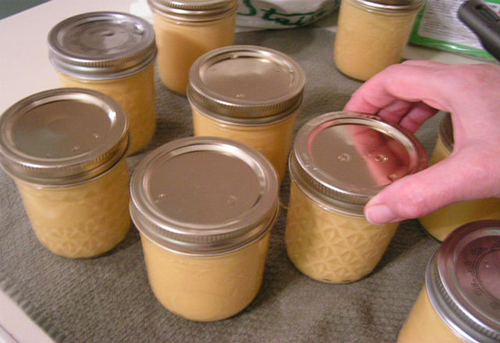 If you keep it in refrigerator or a root cellar after waxing it will easily store for 5 years. Botulism is an air born bacteria. Being already processed when canning doesn’t make it safe as by melting, stirring and then pour into sterile jars does not protect you. Better to salt and wax (hard cheese). By the way if this is a SHIF situation you are aware that by the time you get the symptoms you are possibly dying or going blind. There is NO CURE. Sorry, botulism is a soil borne bacteria. 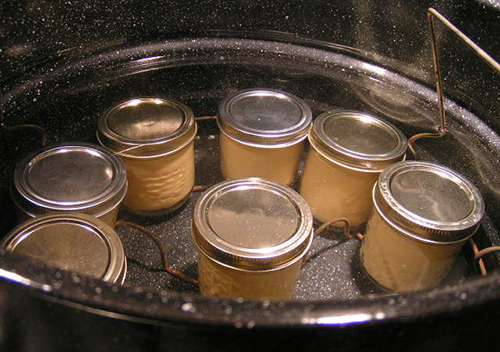 The spores can be killed by heating to 248°F/120°C for at least 5 minutes which would require pressure canning as the boiling point of water is 212°f/100°C. The danger is the toxin it produces which is heat labile and can be destroyed if heated to above 176°F/80°C. 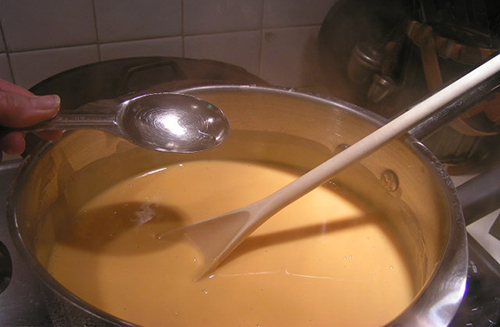 Not all botulism bacteria cause spoilage of the food, but can/does release toxin into the food. The danger is you don’t know what may contain toxin. The spores are generally not harmful to healthy adults but the danger of spores is they can colonize baby guts due to their higher stomach pH and then produce toxin. 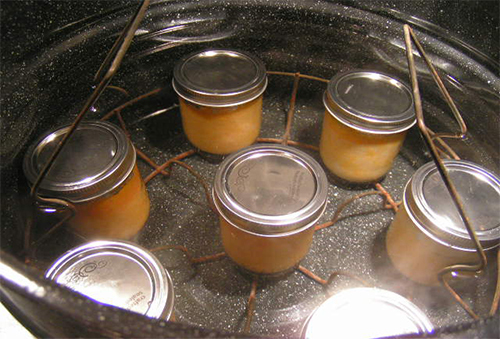 Pressure canning is the safest way to can anything. In the case of cheese, the wax dip and store is the best and safest way to preserve cheese. 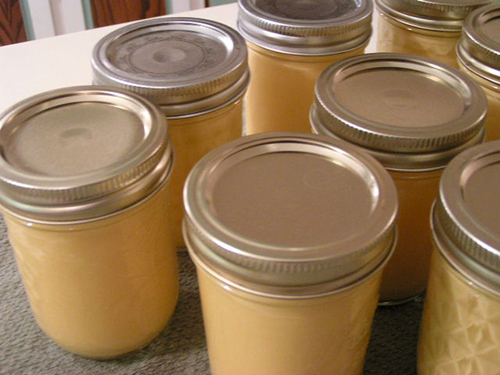 In the case of Velveeta or “American” cheese, neither of which are actually cheese and can not be waxed and stored, canning would be the way to go. As it is already a highly processed and sterile food, if sterile techniques are used, it should be safe to can. Again pressure canning would be safest but you may be able to safely can them using only a boiling water bath if you are careful. there is semi-reasonably priced powdered cheese at the san francisco herb company’s web site. long term, having the flavor of cheese to add to foods is very desirable. i agree w those who have concerns with botulism. not a high probability, but a high fatality rate if it happens. 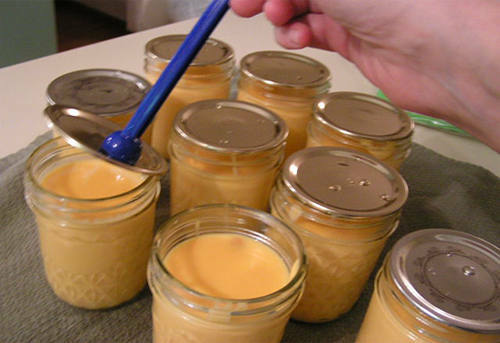 home canning of cheese is similar to home canning of dense pumpkin and winter squash–hard to get sufficient heat to the center of the jar. i suspect that if you manage that feat, you radically alter the structure of the cheese. the university extension service attached to each state’s land grant college is a good source of tested advice. 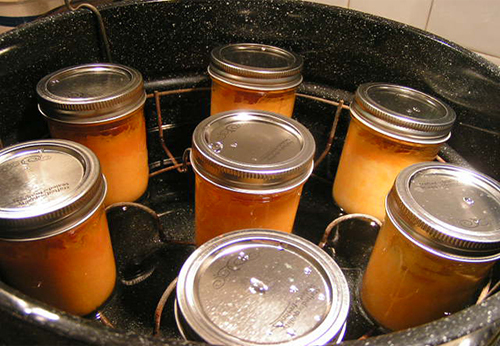 ball canning jars’ web site (fresh tech) is another way to learn more about canning safely. With the home canning of the squash and pumpkin, though, I find it interesting that it seemed perfectly all right to do until the late 1970s. Frankly, I think If you make sure the pumpkin or squash has been uniformly puréed and then heated to boiling and using a hot pack process, adding boiling water to make it a bit thinner than you’d need for pie, it will be fine. That’s how it was done for years, and you’d pressure can the jars. Not everything that was done for years is necessarily the best way, but I think there’s also a gap between “government tested and approved” and “unsafe do not do at all,” and this is one of those things in the gap. 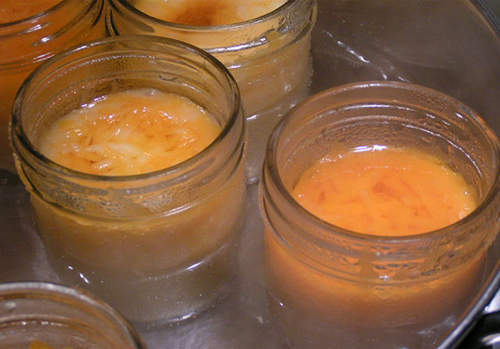 I would not want to waterbath cheese to preserve it; I’d consider using a pressure canner or trying something I saw on a YouTube video presented by Katzcradul, where she showed how she canned cheese. Botulism is no joke, but if you work in a scrupulously clean kitchen, avoid cross-contamination, and use common sense, you can avoid botulism. I/m not so sure this is safe, water bathing a low/no acid food isn’t safe unless it had a ton, as in inedible. I would want to pressure can this for 90 minutes minimum and, I don’t know how that would affect the cheese. I wouldn’t eat it just water bat canned unless it was stored under refrigeration, which defeats the purpose – could just vacuum seal the cheese and, it would be good for months in the refrigerator, or leave Velveeta on the shelf for a few months, it’s fine as it comes from the store.